"They just strolled around the house and looked really hot. So we turned on the sprinklers and they were happy." Temperatures have reached record highs in Alaska over recent days, but humans aren't the only ones feeling the heat. Fortunately for wildlife also in need of relief during the unusually hot days, there are folks in the region who are more than happy to help them cool off. 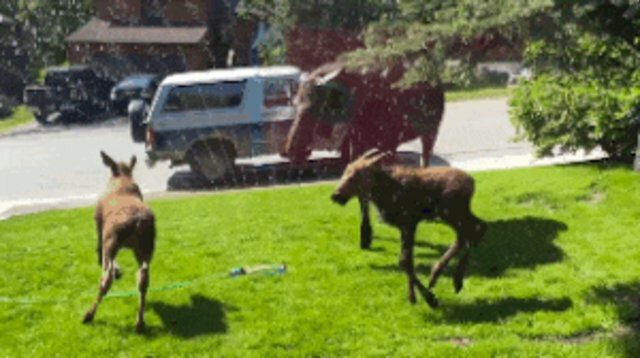 On Sunday, Candice Helm noticed a mama moose and her twin calves wandering through her Eagle River community, appearing rather distressed to be stuck out in the unseasonably toasty late-spring weather. But instead of turning a blind eye to the forlorn little family, she decided to do the neighborly thing and assist them. "They just strolled around the house and looked really hot," Helm told local news station KTUU-TV. "So we turned on the sprinklers and they were happy." The overheated animals seemed more than appreciative of Helm's nice gesture as they frolicked and played through the fountain on her front lawn. 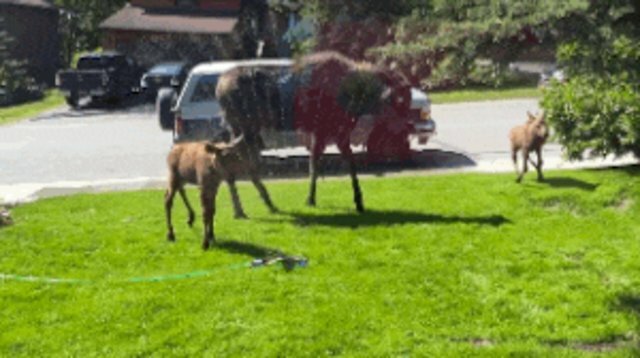 Even mama moose, who dutifully kept watch while her little ones had fun, couldn't help but prance a bit in the cooling waters provided for them by Helm. For her act of courtesy and concern for the moose family, Helm was treated to this sweet scene that she won't likely forget anytime soon - offering further proof that showing kindness to animals is often its own reward.